The Pine Pond Trail in Lake Placid is a little bit of an unusual trail. It is actually an old woods road that connects Averyville Road in Lake Placid to Oseetah Lake in Saranac Lake. 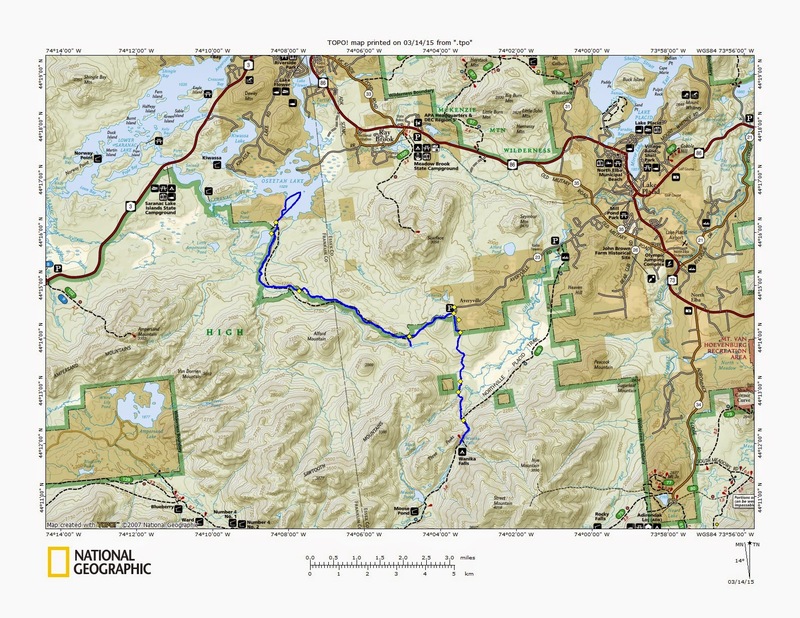 The trail appears to closely mirror the boundary of the High Peaks Wilderness (to the south) and the Saranac Lakes Wild Forest to the north. As such, you'll see both Wilderness signs and Wild Forest signs as you make your way along the trail. What is unusual, is that the trail is a designated snowmobile trail and ATV trail. Since motor vehicles are not allowed in a wilderness area, the route must either be wholly in the Wild Forest or be a specially designated corridor. I took the opportunity on Saturday to cross country ski the trail. I followed Averyville Road (off Old Military Road) to the end, then followed the gravel extension 0.5 miles to the designated parking area. The trail is not signed and markers are few and far between. Most of the markers are faded and illegible. That said, the path is quite easy to follow since is is an old woods road. Almost immediately (at the first bend in the trail), I saw ski tracks bearing left heading south. This is the old Northville-Placid trail which is still in nice shape and is used by skiers and others. I continued on the Pine Pond trail. The snowmobile trail had a dusting of snow over a hard surface. The track was quick for the first couple hours. On the way back, the snow was softening, and that slowed down the guide speed of my skis. The biggest hill on the trail is at the beginning. You climb about 150' before descending in similar fashion. After one more smaller incline, it is generally a long gradual descent to Oseetah Lake. At 1.3 miles, I came to a junction where a left turn takes you 0.25 miles to small marshy pond on the East Branch of Cold Brook. After skiing there and back, I took the right fork to continue on the Pine Pond trail. None of this is marked with signs. One of the few snowmobile markers that was legible. The trail winds through mostly hardwoods early in the hike, but enters softwoods as the trail gets close to Cold Brook. This area was my favorite part of the trail. At 5.5 miles, the trail turns north towards Oseetah Lake. Soon I could see Pine Pond on my left through the trees. At the north end a short spur trail lead to a campsite at the waters' edge. I didn't spend any time at Pine Pond, but continued on to Oseetah Lake. My dog Rev was the first to venture out on the lake. Most of the snowpack covering the ice was now gone which actually made the skiing easier. I was out on the lake for about 30 minutes and then it decided I better start the 7 mile trek back. The temperatures were warming up a few degrees and the snow had softened on the trail. The combination of the soft snow and the uphill grade made my return a little slower. It was about 2:30 when I was on the verge of returning to the car. On the spur of the moment, I decided to ski south on the old Northville-Placid trail for awhile (even though I had already gone 15.5 miles). Soon I ran into a woman skiing with her dog. She told me the skiing had been good. She had gone about 2 miles down the trail. 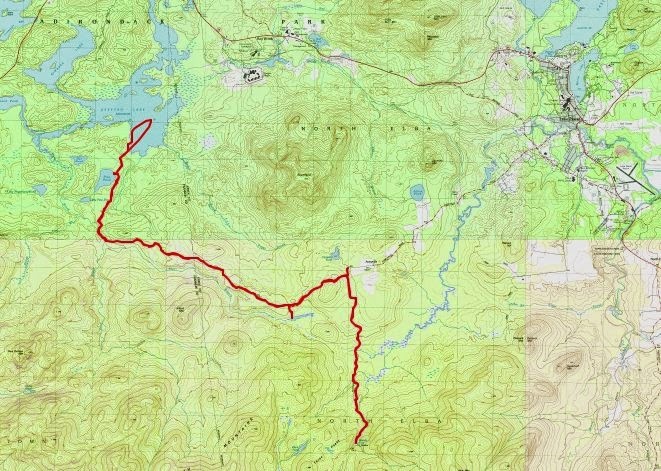 I looked at my map and saw that Wanika Falls would be about 3.5 miles. It would add about 2 hours onto my day. That would be fine I thought, so I headed for the falls. Once again there was a long gradual downhill grade that lasted 2 miles. After crossing a drainage to the Chubb River, the former NP trail begins to climb towards the pass that contains Wanika Falls, At 2.9 miles, I reached current Northville Placid and saw my first signs of the day. I've always assumed that the re-route of the NP Trail was done to eliminate the miles of walking on Averyville Road, but I don't know for sure. From the junction of the old and the new trail, it was 0.8 miles to Wanika Falls. The trail was still broken out from previous skiers. I continues 0.6 miles further until I reached a spur trail that goes directly to the falls. The 0.25 mile spur trail was unbroken and an uphill climb. It was getting late and I still had to get back, so I turned around at this point. The ski trip back went surprisingly well. I was tired, but I moved steadily and before I knew it, I was back at the car. It was about 5:10 PM and it still had not rained. It was a wonderful day exploring terrain that was new to me. I have skied a number of trails in the last five years in the ADK's, and I think this trip off of Averyville road out to Oseetah Lake was one of my favorites. The hemlock groves were great and the later half of the weighted down conifers from the recent snow were magical, photos didn't give it justice. And the ski out onto Oseetah Lake with the back drop of the peaks was well worth the 15 mile ski.